Over the next few weeks, months, year? (I’m really not sure yet) I plan to share all kinds of goodies that help me get my life back on track. I’m sure that’s going to include many “mini” schedules that I’ll fit into my one main schedule. 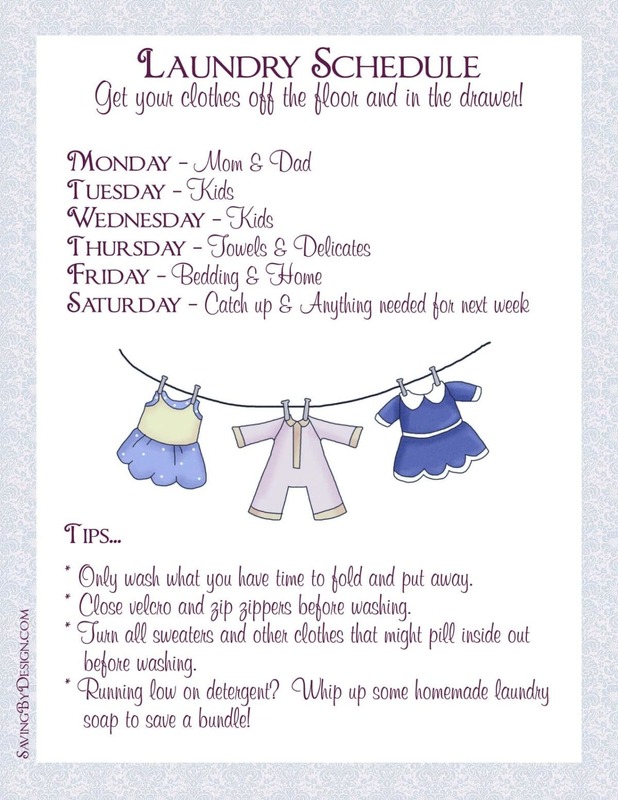 And I have the very first “mini” schedule to share with you today…my laundry schedule! It sounds like such an easy task…I mean you put the clothes in the washer, put them in the dryer, fold/hang, and then put them away. So then why do I end up with endless piles scattered all over each bedroom floor? Well I’m getting those piles off the floors and back in the drawers! I thought about what piles end up to be the biggest and how many loads my daily schedule allowed me to do and created a schedule. See that last tip on the printable? 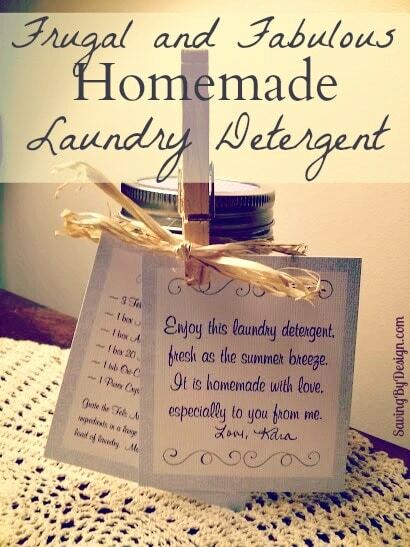 Homemade laundry detergent? It’s fabulous! It just smells so good, works great, and is mostly natural. Oh and how can I forget about the price? It’s less than $25 (before coupons, so even less if you use them or store rewards 😉 ) for about a year’s supply! Once you try it, I’m sure you’ll be happy to share it with your family and friends. Here’s an easy, yet pretty, way to do just that. Add your detergent to a mason jar and pretty it up with some raffia, ribbon, or twine. Add a cute tag and recipe card attached with a clothespin and you’re all set! It’s perfect to share with your friends, as a housewarming gift, for Mother’s Day, and more! This post is part of the “Take Back Your Life” series. Take a look at >> this page << to see all the posts from this series and take back your life! « Take Back Your Life: Schedule Everything! Is the detergent safe for HE washers? Do you shave the fels naptha bars?? This is safe for HE washers. That is what I have. Love this detergent!!! Awesome! Thanks for sharing LeAnn 🙂 I don’t have an HE washer but have heard from others that it works in great with them. And when I was putting the detergent together almost all of the ingredients individually said they were safe to use in them. Some of the shavings from the bar soap stay behind after I’ve washed a load of laundry. Is that normal?